Diversity in the Power Elite is a provocative analysis of the diversity that exists — and doesn't exist — among America's powerful people. Richard L. Zweigenhaft and G. William Domhoff examine the progress that has been made, and where progress has stalled, for women, African Americans, Latino/as, Asian Americans, LGBTQ people, and Jewish people among what C. Wright Mills called the "power elite," or those with significant financial or political influence in the U.S. The third edition of this classic text has been fully revised and updated throughout. It highlights examples of profound change, including the presidential election of Barack Obama, the nation's first black president, as well as the growing acceptance of LGBTQ people. And it also highlights the many ways that the promise of diversity has stalled or fallen short — that the playing field for non-white males and women is far from level. Filled with case studies that illuminate deep research, the book reveals a critical examination of the circles of power and discusses the impact of diversity on the way power works in the U.S. Available now from Rowman & Littlefield (at 25% off with the promo code RLFANDF25) and on Amazon.com. "Diversity in the Power Elite is a stunning book, one that deeply explores the rhetoric of equality in American life and its stark realities among the political, economic, and military elite. It comprehensively studies how Affirmative Action policies did little to shrink social divides based on race, ethnicity, gender, sexual identity, and class. Using extensive and up-to-date data, Zweigenhaft & Domhoff show us that inherited wealth and its privileges still reign supreme among those who wield power in contemporary America." "As American society becomes increasingly diverse and approaches the demographic crossover to a majority-minority society, it becomes ever more crucial to understand the impact of diversity on higher tiers of the economy and polity. Zweigenhaft and Domhoff's Diversity in the Power Elite is a profound contribution to our knowledge and will radically revise the assumptions of many Americans, because it shows diversity at the top occurs in tandem with thorough-going assimilation of the socially ascendant to the worldviews of the already established." "Zweigenhaft and Domhoff's new edition is essential reading for scholars and students of diversity and inequality in America. 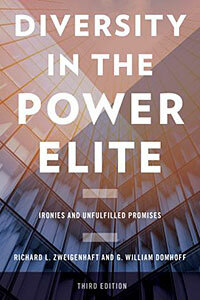 The book reveals a historically grounded and nuanced analysis of the changing membership in America's power elite. While elites are more diverse than in the past, demographic change has stalled and does not represent a re-writing of the rules of the class game. Narrow class interests continue to shape the perspectives of those who hold power in America." "This is the third edition of Diversity in the Power Elite, and each edition bears its own subtitle.... The subtitle of the present edition signifies Zweigenhaft and Domhoff's shift in emphasis, with a series of chapters describing the modest increase in diversity in the power elite... chapters on Jews, women, blacks, Latinos, Asians, and LGBT people form the core of the book. The most interesting chapter is the last one, 'The Ironies of Diversity.' The authors argue that the central irony is that the diversity achieved 'reinforces the unchanging nature of the class structure and increases the tendency to ignore class inequalities.' Another featured irony is the 'improbable partnership' between African American leaders and Republican leaders to redistrict southern states into a few majority African American congressional districts and mostly predominately white districts with Republican majorities. To understand the limited gains in diversity, one must understand that class, education, and skin color are crucial, as is the ability to conform to the white Christian male culture that still dominates the upper echelon of US society."